Artist Salvador Dalí visited Hollywood in 1937. With him he brought his wife Gala and an idea for a film he wished to create with the Marx Brothers. As a token of his esteem for the one with the "marvelous wig," he also brought a harp strung with barbed wire. The film, entitled Giraffes on Horseback Salads, was never made, reportedly because MGM, which had an exclusive contract with the Marx Brothers, felt it was too surreal. The script consists of 22 pages original blue ribbon typescript in French with handwritten ink corrections and is owned by the Fundació Gala-Salvador Dalí in Figueres, Spain. 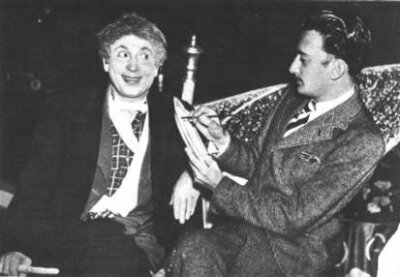 Apart from roles for the Marx Brothers, the script includes a character called the Surrealist woman (to be played by Gala) and a Spanish businessman named Jimmy. The Surrealist woman is lying in the middle of a great bed, sixty feet long, with the rest of the guests seated around each side. Along the bed as decorations are a group of dwarfs caught by Harpo. Each is supported on a crystal base, decorated with climbing flowers. The dwarfs stay as still as statues, holding lighted candelabras and change their positions every few minutes. While love tears at Jimmy's heart, Groucho tries to crack a nut on the bald head of the dwarf in front of him. The dwarf, far from looking surprised, smiles at Groucho in the most amiable way possible. Suddenly in the middle of dinner, thunder and lightning begin inside the room. A squall of wind blows the things over on the table and brings in a whirl of dry leaves, which stick to everything. As Groucho opens his umbrella, it begins to rain slowly. Although the guests show surprise, they try for a time to continue their meal, which is, however, brought to an end by showers of rain. In panic, the guests rush in all directions, while from the hall a torrent of waters washes in, bringing with it all sorts of debris, including a drowned ox. A shepherd makes a desperate effort to collect his flock of sheep, which climb up on the sofas and the bed in an effort to avoid being carried away by the water. A cradle is carried in on the flood containing a baby crying piteously, followed by the mother, hair streaming behind her. The Surrealist woman crosses several rooms as the rain is falling more and more heavily but stops in front of a door and hesitates. She goes in, followed by Jimmy, who has never left her side. On the other side of the door, there is no more rain and everything changes. It is the childhood room of the Surrealist woman where by her orders nothing has been touched since she was ten. Overcome by emotions, she sits down in front of a mirror at a child's table. Meanwhile, the Marx Brothers announce that a great fête is going to take place. For this, large preparations have to be made. Four acres of desert are cleared of cacti and of all vegatation and flattened out like a tennis court. The undergrowth that is cleared away is piled around the field to make a barrier, behind which stands are erected for spectators. There is a competition for the person who can ride a bicycle the slowest with a stone balanced on his head. All the participants have to grow beards. In the middle is a tower in the form of a boat's prow to be used as a judge's box. Before the spectacle begins, the vegetation around the fields is set alight. This prevents the spectators in the stands from seeing anything at all. From the top of the tower the sight is wonderful, with columns of smoke going up vertically, surrounding hundrds of cyclists - each balancing a rock on his head - threading their way with the sun setting behind. 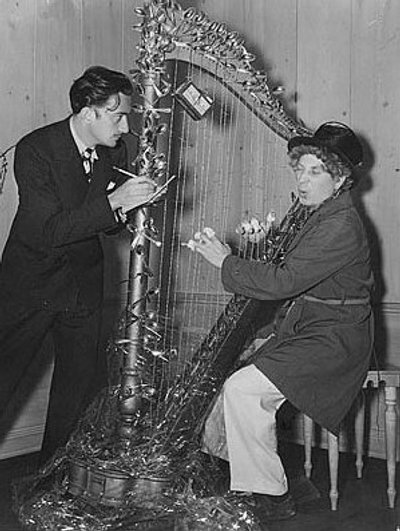 In the tower, Harpo is playing his harp ecstatically, like a modern Nero. By his side, his back to the spectacle, Groucho is lying, smoking lazily. Nearby, the Surrealist woman and Jimmy watch the spectacle, lying side by side. Behind them, Chico, dressed in a diving suit, accompanies Harpo on the piano. Scattered across the gangway leading to the tower, an orchestra plays the theme song with Wagnerian intensity as the sun sinks under the horizon.